WE ARE YOUR EXCLUSIVE NY METRO HEADQUARTERS FOR TAMA'S STAR SERIES! Yes, the Tama Star series is coming to our NY store. We are very excitied about this line. And, if you look below you will see that I debuted this line 3 years ago in my NY store when it was first launched. I loved it then, and since that time Tama has added the new Star Walnut series to accompany the original Star Maple and Star Bubinga. And, my good friend Peter Erskine has signed on as a Star series artist as well. Also, right here in midtown NY, Joe Saylor now plays the Star series each night on his gig with "Late Night with Stephen Colbert". So, stay tuned because we will soon have Star series sets here for you to try! Meanwhile, click on the two videos (below) that I did for these sets and you will see what I am talking about. 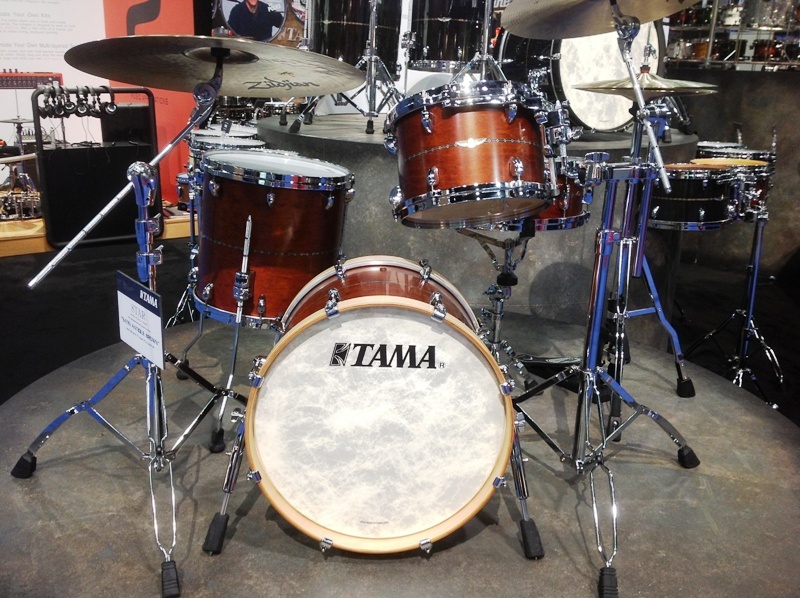 As promised, the good folks from Tama brought out their new Star series drums to a good crowd at our NY store. The Star series is an entirely new design for Tama intended to focus on the jazz market, which has not been a mainstay of the Tama line since back in the days when Elvin and Billy Cobham were with Tama. The concept behind these drums was to deviate from Tama's traditional shell design and create one specific to the jazz drummer's needs. Additionally, there are several interesting hardware enhancements that provide added isolation and improved resonance via a new lug design, new spurs, and new floor tom leg brackets, all of which essentially allow the drums to "float." This concept worked well and resonance from these sets was excellent. The shell design is a ply shell and it comes in two different woods: maple and bubinga. 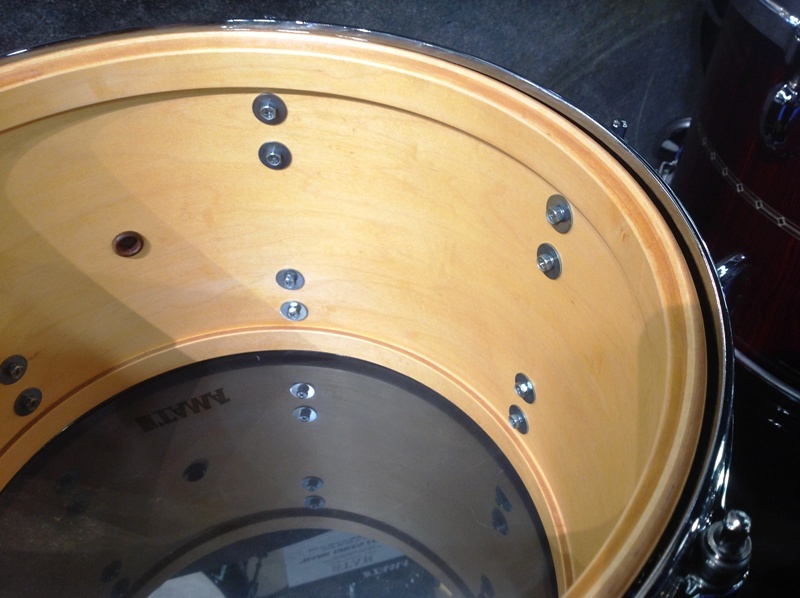 The shells have reinforcement rings (which Tama traditionally has not done) and a new, more rounded, bearing edge. The finishes are excellent and there are many to choose from. The finishes vary from wood stains to sparkle lacquers and also some solid lacquers. All have a very tasteful wood inlay across the center of the drum. Although the inlay is an option you can elect not to have, we like it and feel that it adds elegance to the appearance of the set and that it is an excellent complement to the high quality finishes. The maple kit we reviewed was a standard bop kit with 8x12, 14x14, 14x18, 5x14. The set had medium weight coated batter heads and clear bottoms on toms and snare. The bass drum was shipped with a muffled batter head which we immediately removed since a 14x18 bop kit is better suited to a medium weight, unmuffled coated batter head. The resonant head had some built in muffling but we left that on. As you will see and hear in the video, this set responded beautifully and the sound was excellent. The drums sing and are extremely sensitive to the touch. You do not have to "fight" the set. The drums work for you, which is how a fine quality high end instrument should respond. The instrument should be a joy to play and it should respond to every nuance. This is particularly important when crafting a kit for the jazz market where players demand that a kit provide response and sensitivity at all volume levels. The drum set needs to become an extension of the player and needs to allow the player to produce a wide variety of sounds, from subtle to extreme, with ease. This maple set did the trick. We were extremely pleased to sit down and play this set. And, the overwhelming opinion from our other guests was favorable as well. And, that says a lot because the NY jazz drummers on the scene today are VERY demanding and they are a tough crowd to please. Suffice it to say that this set was a crowd pleaser. The Bubinga kit we received was a larger configuration with standard depth drums in 8x10, 8x12, 14x14, 16x16 with 14x22 and 14x18 bass drums and a 5x14 snare. 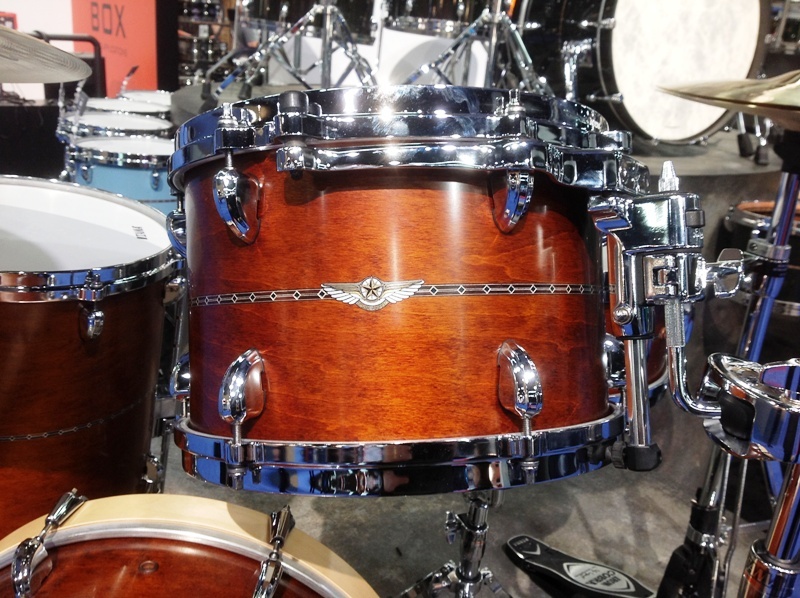 The all-Bubinga shell has the same bearing edge as the maple shell, but the Bubinga wood has a darker sound. The kit was initially set up with all the drums listed here and the tuning was low. This set, in this tuning range, sounded like what we are used to hearing from traditional Tama drums. It was excellent, but in this tuning range it was not suited to jazz players. It was better suited as a rock kit. Nothing wrong with that, but if this line is intended to draw from the jazz market then the true test would come when we try tuning the set for a jazz drummer's ear. To accomplish this we took the 8x12, 14x14 and 14x18 and the snare drum aside. We swapped out the BD muffled batter head for a coated, medium weight with no muffling and then tuned the kit. This set responded beautifully to the higher tuning and as you will see and hear in the video, the Bubinga 12/14/18/5x14 combination used in the video sounds as good as the all-maple kit did, but a little bit darker in terms of tone due to the Bubinga shell. All drums are made to order, so there are no "stock" shells sitting in piles somewhere waiting to be assembled into kits. This is a product that is hand made with care, so expect a lead time of about 150 days. In terms of pricing and marketplace acceptance, this is an area where Tama has invested time developing the line and the market. Tama is generally not known as a jazz drummer's brand, and they have been patient in developing their reputation as a high end provider of jazz drums. Since this is a high end product this is NOT your run of the mill "buy it off the internet" type of drum set. Both of these sets are definitely worthy contenders in the high end jazz drum set market. As a result, these are expensive drums and will require a distribution network that is knowledgeable and understands the nuances of selling high end equipment that requires a hands-on approach. This is a set you want to touch and feel. Pricing: As we said earlier, these are expensive drums. The 4 piece bop kit with an 8x12, 14x14, 14x18, 5x14 will likely have a street price in the range of $5700. That's a chunk of change, but not a lot for a high end, high quality instrument. The drums are built with care, integrity and are ultra high quality, and most importantly, they sound wonderful! So, they are worthy of a premium, and I feel that the new Star series is ideally suited to re-launching Tama in the jazz drumming market place. ORIGINAL POST: Well, this could be very exciting. We all know the Tama name and we know they make fine drums. However, one thing Tama IS NOT known for is being the drum of choice for jazz players. Well, Tama wants to change that and the new STAR series from Tama is the benchmark for this change. AND, we're going to test the theory here in our NY store. That's right, the folks from Tama asked me if they could bring this new kit (8x12, 14x14, 14x18, 5x14) to our NY store and they want us to put it through its paces. They are extremely confident that this set has the right "vibe" for jazz drummers and they want to bring it to our shop to prove it. AND, we want you there to see it and experience it. So, you are invited to stop by our NY shop on Monday, February 18th 11am- 2pm to see it for yourself. We'll have free espresso of course, and free wine. The good folks from Tama will bring the kit in. I will personally play the kit and we will video the demo and post it on our website for all to see. As you all know, I will give it a very thorough workout. AND, both myself and the folks from Tama want your opinion as well. And, they will also bring a 6 pc kit in addition to the bop kit. STAR is the new flagship line for TAMA drums. It takes the knowledge and research we cultivated for the Starclassic series to the next level, by reexamining every detail to enhance shell resonance. STAR drums are available in two shell types - Bubinga, with its rich, deep tone; and Maple, which offers a bright and open sound. STAR drums introduce many exciting new features, such as the "Super Resonant Mounting System", which improves resonance, unique shell constructions, and the Quick-Lock Tom Bracket, a ground-breaking memory lock system. I had a chance to see this set at NAMM this week. I didn't play the kit, but I heard it a bit and it sounded nice, but the noise levels at NAMM are not conducive to any sort of serious test of the sonic capabilities of the set. So, the time spent in our NY store on Feb 18 will be the real test. The kit has a definite vintage vibe in the construction of the shells and the bearing edges. The design is classic and clean, with a wood inlay on the shells and a nice, crisp look. All drums are hand made and all sizes are available and there a number of very attrractive finish options as well. Nice, functional hardware that is neither too much, nor too little. Just right. And, the hardware has some nice innovations. Very soon we'll give it a test and see how they feel and sound. So, COME ON DOWN and help us out on Feb 18th between 11am and 2pm. Call the shop and let our guys know you'll be coming so we can plan accordingly.